The Design for the Environment (DfE) label is now the Safer Choice label. Safer Choice products are equivalent to DfE-labeled products. Safer Choice-labeled products must meet the same high standards – EPA’s Safer Product Standards – as products with the DfE label. The Safer Choice Program includes products designed for homes and businesses. They are safer choices for your workplace, schools, and community. 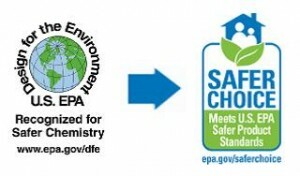 For a complete list you can link to: www2.epa.gov/saferchoice/products.